Client report information in AssetLogic can be uploaded as documents, data fields or a combination of both. All background client reporting information (such as the domicile country, initial amount invested and inception date) is captured in the mandate object. 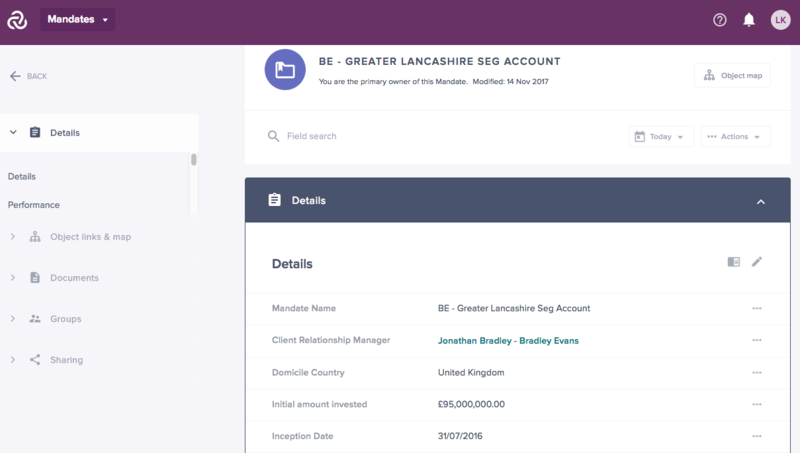 The fields have been built to capture individual data points to enable the manager to have control and flexibility over what they share; and also so that investors can search for specific details and get alerts when key data has been updated. There are over 200 fields on the mandate object to satisfy many different types of asset class. A full list of all the fields can be found in the field guide. PDFs, factsheets or branded documents can be uploaded on the mandate object and that document can be downloaded by anyone that it is shared with. By sharing information in this way, all parties involved have access to the full audit history of every data point and document, when they were updated and by who. Attached to the mandate object, the manager can provide performance and share class objects specific to the investor’s portfolio. The document holding functionality on the object allows the manager to update the pdfs of the reports or factsheets as well give a greater choice to their clients about how they receive their information. What is a representative fund or share class? How do I share a client report?